Being half British, every day at four o’clock in the afternoon at Granny and Grandpa’s house, tea was served. This was not simply a mug of tea with a bag on a string. We are talking serious tea, carried into the living room by Grandpa, on an antique silver tray. Piping hot tea in a gorgeous antique silver teapot (Victorian of course), rich cream in a matching creamer, sugar cubes (ok this was a nod to convenience) in an ornate silver sugar bowl with an antique silver spoon, and of course, a silver strainer to pour the tea through into our porcelain tea cups, were all presented on a gorgeous silver footed tray. Naturally, biscuits (cookies really) were served with “Tea”. (No wonder I was a little rounder then!) This tradition made an indelible mark and gave me an appreciation and love for these stunning silver tea sets and the joy of family tea time. My beloved grandparents gave me a beautiful antique tea set as a wedding gift, dating from 1896. This gorgeous set is displayed in my dining room, ready for tea time when my parents visit. Otherwise it sits proudly as silver sculpture, a historic and beautiful set, handcrafted by skilled silversmiths. This is truly one of my prized possessions. I wondered why Brits love tea and how tea-time tradition evolved. 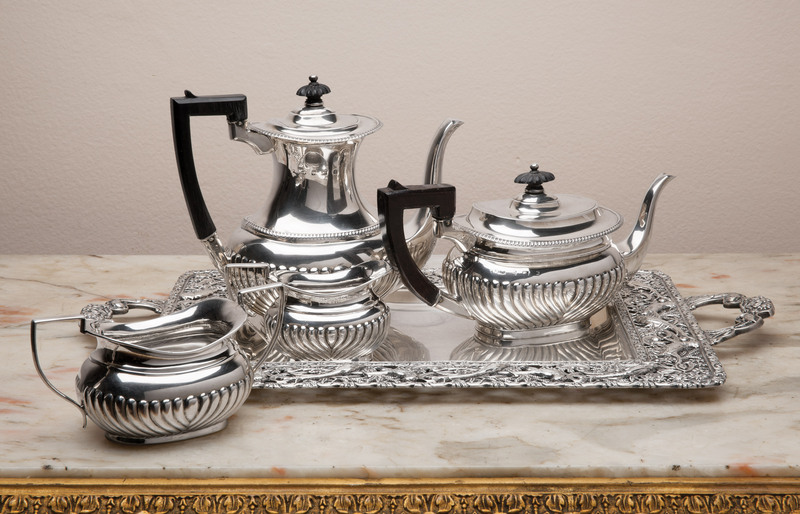 This elegant tea time trend and refinement in silver-smithing was a perfect marriage which resulted in the design and development of gorgeous tea services. Schweitzer Linen has a stunning Tea Set available from this era. The ornate feet, swirling motifs and detailed handles and tops are beautiful examples of the high level of artisans of the era. These pieces present themselves as works of art and should also be used to bring the family together to enjoy afternoon Tea. Start your own family tradition. Bring out your favorite tea and cookies with other beautiful tea sets from Schweitzer Linen Antiques Collection shown below. It’s 4:00! Many believe that the first Western European to drink tea with the Chinese was Father Jasper de Cruz, a Portuguese Jesuit Missionary exposed to China because of the new ocean trade routes between Portugal and China. Not much oral history was documented from the time, but some suggest that tea leaves were to be served like vegetables, with salt and butter. (This is unlikely!) We do know for sure that the first tea sets and exotic taste of tea found their way to Europe via these Portuguese trade routes in the 1600’s. Portugal and Holland had been politically allied in that era, which enabled these traditionally Chinese tastes and novelty items to reach the Netherlands and spark a tea frenzy. Prices for tea were astronomical in the 17th century. $100 bought a pound of tea! Only the wealthy could afford this luxury therefore the style of European tea sets consisted of tiny teapots and cups. Adding milk to tea is thought to have been a Dutch concept. Commodities like as sugar and ginger were seen as rare wonders from foreign lands. Fashionable tea rooms sprang up in chic hotels and public meeting places. Trendy portable tea sets were supplied to guests in these commercial establishments, which led the way outside to the inn’s garden, where they prepared tea for their friends, al fresco. In Europe, by 1675 tea underwent drastic price reductions due to the refinement of trade routes. Asian goods and customs soon became the height of fashion. 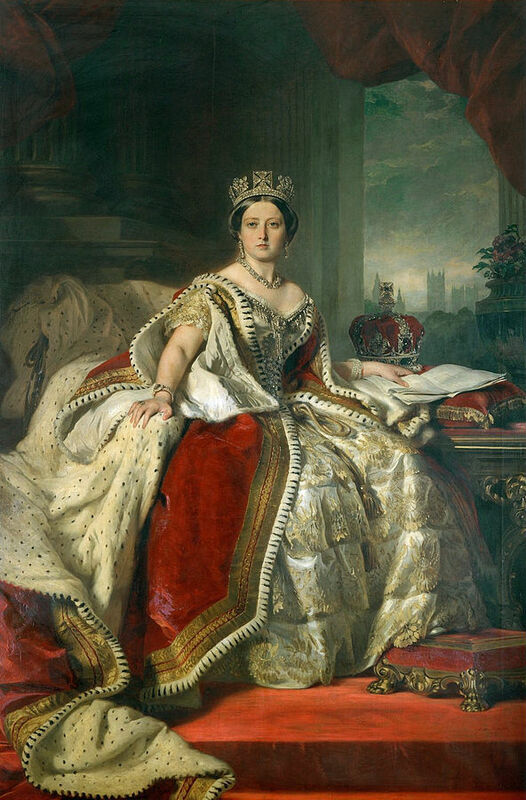 We have the leading social critic of 1680, the Marquise de Seven, to thank for first advocating the addition of the creamer to the tea service, and the sugar basket was soon to follow. During the reign of Queen Anne (early 18th century) silver sugar baskets were first presented. These first silver creamers and sugar bowls featured three-footed rounded bases, with the sugar bowl having a hinged disk-like top. By the mid-18th century, the tea set somewhat familiar to us today had arrived on the tables of Europe and America. 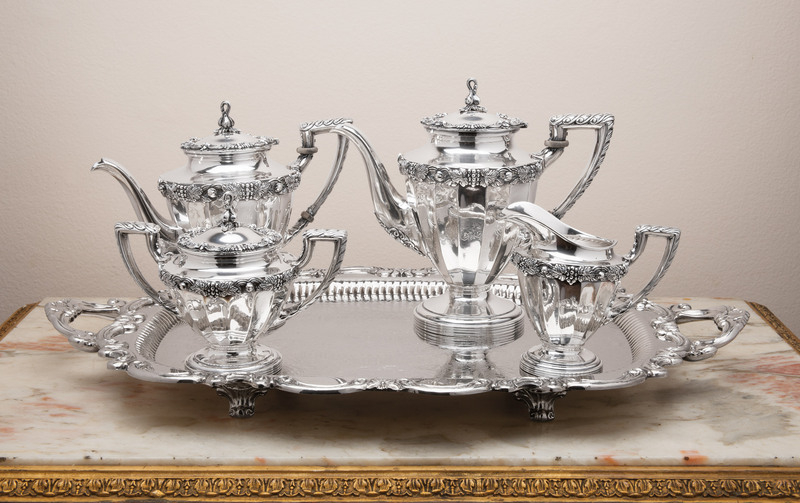 Though the first complete silver tea service was presented to the public in 1790, it was not until Queen Victoria’s reign that the modern six piece tea service arrived. The Queen‘s tea service included teapot, creamer, sugar bowl, tea kettle, coffee pot, and waste bowl. 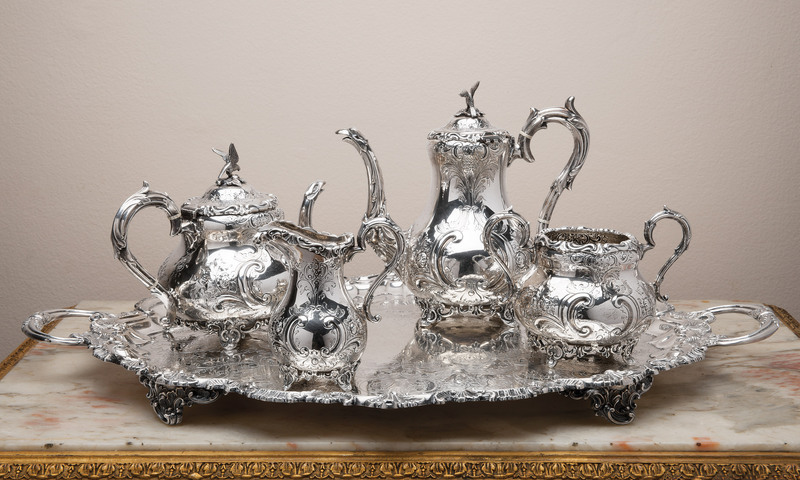 Thankfully, this style of silver tea sets and tea time tradition has gone virtually unchanged in our modern day. We still love our teatime as a social or family tradition. Teatime elegance is everlasting!